At least seven confirmed tornadoes hit southeast Louisiana Tuesday, causing major damage as a wave of severe thunderstorms swept through the region. Louisiana Gov. John Bel Edwards said at a news conference at least seven confirmed tornadoes touched down in the state, including two in Livingston Parish, and one in six other parishes. He declared a state of emergency in the wake of the storms. There are at least 20 people reported injured statewide, according to Edwards. New Orleans Mayor Mitch Landrieu said the city suffered “a terrible blow,” and that the tornado that struck the east side of the city traveled around two miles and affected a half-mile swath of land. “I want to think we’ve been through many things together, and we will get through this together with prayers,” he told reporters. 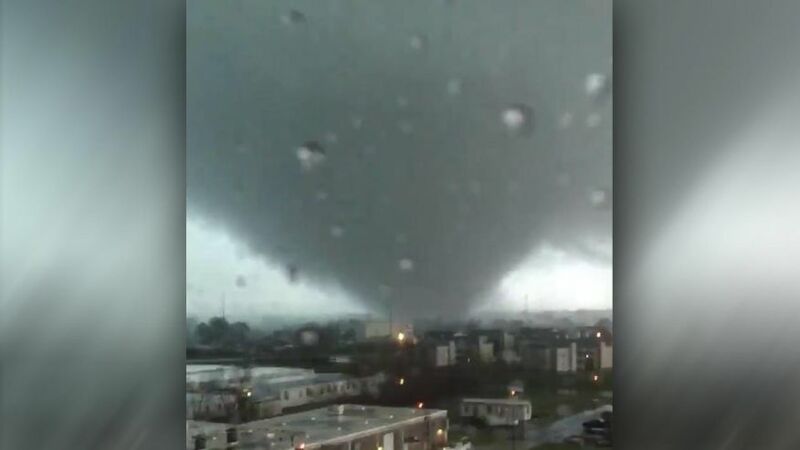 The large tornado in New Orleans touched down northeast of downtown along Interstate 10 and Chef Menteur Highway, Fox 8 reported. Images from the area showed severely damaged buildings with downed power lines strewn across the road. Over 15,000 customers are without power in several areas of the city and surrounding area, according to Fox 8. James Thomas, a resident of Eastern New Orleans, told the Associated Press his his whole neighborhood shows storm damage, but his house escaped the tornado. Thomas said he saw the twister coming, grabbed his motorcycle helmet and ran into his bathroom. The room then went pitch-black, he heard hail on the window, and came outside afterward to see a damage trail or about 20 to 40 feet from his house. NASA said in a series of tweets the tornado in Eastern New Orleans impacted the Michoud Facility, but only minor injuries were reported and personnel are being accounted for. The onsite Michoud emergency response team is also conducting damage assessments of buildings and facilities, according to NASA. Yoshekia Brown, who lost everything to Hurricane Katrina in 2005, lost everything again on Tuesday when three-quarters of her home in New Orleans East collapsed in the storm. Tornado watches covered large parts of Louisiana and Mississippi and the line of severe storms prompted multiple tornado warnings. At least seven homes were damaged in Livingston Parish, Louisiana, located northwest of New Orleans, according to Deputy Emergency Management Director Brandi Janes. “Two of them are completely gone… all the way to the ground,” she told the AP. Janes said she knows of two injuries in the parish, both minor, but didn’t immediately have any information on whether the homes that were destroyed were occupied when the storm struck. The tornadoes are part of storm system moving across the Deep South that lit up radar monitors and prompting multiple tornado warnings from Louisiana to Alabama as the system brought hail, high winds and twisters to the New Orleans area. One of the warnings described a “large, extremely dangerous and potentially deadly” twister south of Hammond, Louisiana. White House Press Secretary Sean Spicer told reporters President Trump plans to contact officials in the hardest-hit areas. The National Storm Prediction Center in Norman, Oklahoma, said 2.7 million people in parts of Louisiana, Mississippi and Alabama would be at the highest risk of severe weather on Tuesday. Fox News’ Willie Inman and The Associated Press contributed to this report.